The Free Syrian Army (FSA) announced that it had taken control of the strategic town of Gonderes south-west of Afrin after the siege of the town on three sides, while Ankara demanded the United States to prevent the transfer of Kurdish forces to Afrin. According to reports, the FSA took control of more than half of the area of ​​Afrin, 50 days after the start of the Operation Olive Branch. Fighters succeeded in liberating the village of Mishla, north of Syria, from the control of the Kurdish People’s Protection Units. In addition, with the liberation of the village of Ma’aleh, the number of points liberated in Afrin reached 156 points distributed over 4 towns, 122 villages and 30 sensitive points. Turkey asked the United States to prevent the transfer of Kurdish fighters backed by Washington towards the Afrin region. Ten civilians killed by shelling with a cover of aerial bombing involving Russian fighter jets, in the city of Zemlka, on the outskirts of the city of Hamuriya. The city witnessed violent shelling before the start of the five-hour truce. The Civil Defense had earlier reported the occurrence of suffocation among civilians following the bombardment of poison gas targeted residential neighborhoods in the towns of Saqba and Hamuriya, resulting in large fires in residential buildings. An AFP correspondent reported that he saw two men lying on the ground in the town of Hamouriya in the eastern Ghouta, with their bodies being consumed by gunfire after a raid on the street, near the body of a third man and an injured woman. Syrian activists posted video footage from a hospital in al-Ghouta last night, where an eyewitness was exposed to poisonous gases, following the shelling of those towns. France renewed its threats of military intervention and said it would respond if chemical weapons were to lead to deaths in Syria. France demanded that Russia and Iran press the regime to abide by the 30-day ceasefire stating, “Russia has the appropriate means to ensure that the Syrian regime respects the UN resolution calling for a 30-day cease-fire”. However, activists stressed that the regime just bombarded eastern Ghouta with chlorine gas again. The Syrian regime tightened control over the town of Beit Siy al-Ghouta. Reuters quoted a military commander of an alliance supporting the Syrian regime today as saying that the regime’s army is about to divide the eastern Ghouta to two parts, so that its advanced forces converge from the east with forces deployed on the outskirts of al-Ghouta from the west. However, one of the most prominent factions of the Syrian armed opposition in Al-Ghouta, denied the news of the close of the forces of the Al-Ghouta regime in two. Turkey and Iraq will take joint steps against the Kurdish militants of the Kurdistan Workers’ Party (PKK) deployed in Iraqi territory. Removing the presence of PKK and other terrorist organizations in Iraq is not only important for Turkey, but also for Syria and Iraq. “Turkey and Iraq intend to carry out a cross-border military operation against the PKK,” Gawishoglu said, noting that Baghdad and the administration of the Kurdistan region of Iraq are very disturbed by the presence of militants called, “the Labor Party” on Iraqi territory. 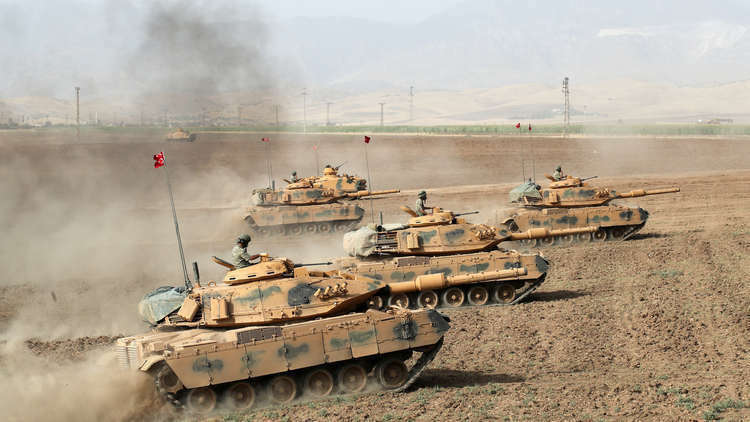 Ankara considers both the Kurdish People’s Protection Units and the Democratic Unionist Party, the main components of the Syrian Democratic Forces Alliance, terrorist organizations and allies of the Kurdistan Workers’ Party (PKK), which has been fighting it for many years. The armed conflict between the Turkish authorities and the PKK resumed in July 2015, after the collapse of their truce in March 2013. Thursday in London, the Archbishop of Canterbury Church, Justin Welby, held an hour-long meeting at the Lambeth Palace with Prince Muhammad bin Salman of Saudi Arabia while reviewing a selection of the first texts of Christian, Islamic and Jewish religions, as well as expressed his concern about the humanitarian situation in Yemen, due to the Saudi campaign there. He called to end the war, while the Prince promised to promote interfaith dialogue. The Saudi Crown Prince promised to work on spreading various religious traditions and promoting interfaith dialogue within the framework of his internal reforms, just only a day after receiving an increase of bilateral trade agreements with Teresa May, worth over $90 billion dollars (65 billion GBP). He had lunch with Queen Elizabeth II prior to meeting with Teresa May. British opposition leader Jeremy Corbin accused the government of colluding with Ibn Salman in the Yemen war, while London demonstrations organized by activists, to express their refusal to export arms to Saudi Arabia over the killing of civilians in Yemen. In view of these demands, the British government confirmed that it had no role in the Saudi war in Yemen, and denied the presence of any British military advisers in Saudi Arabia to support the war, but also did not take a decision to stop selling arms to Riyadh. Meanwhile, Iranian leader, Ali Khamenei, said Iran will not negotiate with European countries and the United States over its presence in the Middle East, but rather must negotiate with the countries of that region. Khamenei said in statements on his official website that the European countries come to Iran and say they want to negotiate with them on the files of the region, and is the result of attempts to drag Tehran to negotiate the files of that region, which may include its missile program. The Iranian leader described the presence of American forces in various regions of the world as malicious and inciting, stressing that his country will not take permission from Washington on its role in the Middle East. “But if we decide to be on American soil then we will negotiate with you”. He pointed out that European countries did not close the door to negotiations with them, but that it is not what the United States wants. Iran is ready to negotiate with the countries of the surrounding region on key issues. In this regard, the Iranian defense minister said that his country is ready to provide military and security advisory services to counter terrorism to Afghanistan like Syria.